Kim Jong-un (January 8, 1983) is the dictator of North Korea, son of the former dictator Kim Jong-Il, and grandson of the first ruler of the nation Kim Il-sung. In December 2011 he was formally declared successor to his father as supreme leader. Officially, he holds the titles of First Secretary of the Workers' Party of Korea, First Chairman of the National Defense Commission, Supreme Commander of the Korean People's Army, and Chairman of the Central Military Commission. He is a Communist and an atheist. 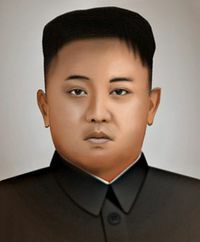 Like his father before him, Kim Jong-un has a reputation for a hot temper and being very easily offended, which frequently leads to threats of declarations of war and attacks against South Korea, Japan and the United States when he does not get his way or he gets offended over perceived slights, whether real or imaginary. Kim Jong-un is known for his personality cult, his obesity is an example of this, for a country with a famine even large as the half of Africa. In April 2012 large portraits of Vladimir Lenin and Karl Marx were removed from Pyongyang's Kim Il-sung Square, presumably on Kim Jong-un's orders. While this may signal an ideological change on the part of the regime, the Workers' Party stopped referring to North Korea as a Marxist-Leninist state decades ago, substituting Kim Il-sung's philosophy of self-reliance, known as Juche. In March 2013, Kim Jong-un started to provoke war with South Korea. He terminated the truce of the Korean War and said North Korea is in a "state of war" with South Korea. In 2013, it was known that Kim Jong-un gave copies of Adolf Hitler's book Mein Kampf to his top officials and ordered them to study it as a leadership-skills manual. In November 2013, 80 people were publicly executed for watching foreign films. In December 2013, Kim Jong-un executed his own uncle Jang Song Thaek. In July 2014 Kim Jong-un delivered weapons to Islamic terror organization Hamas. Since the beginning of 2014, Kim has put on considerable weight, leading to questions concerning his health. In 2017, Kim Jong-un claimed that the Central Intelligence Agency and the South Korean N.I.S. wanted to kill him with biochemical stuff, which is unfounded and nothing more than a provocation as usual by this dictator. ↑ "N.Korean Leader Getting Fatter" Chosun Ilbo, October 10, 2014. This page was last modified on 9 April 2019, at 11:17.